Bank branches are going big on technology. 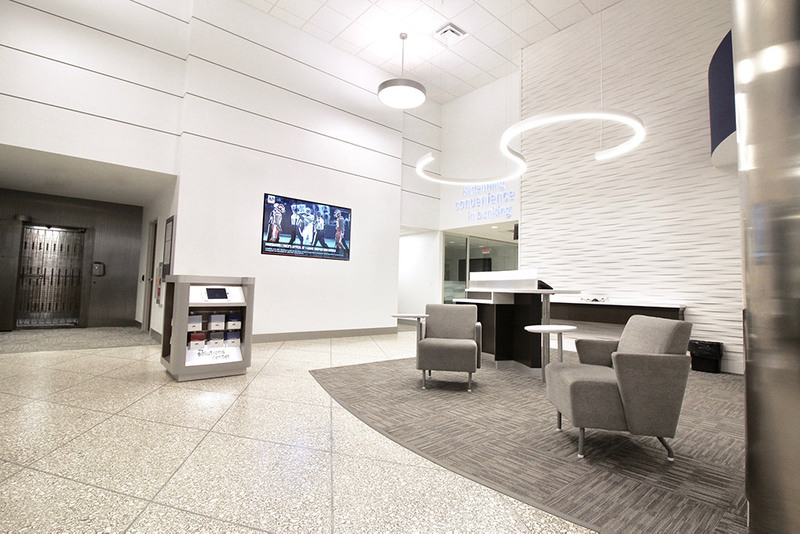 Branch lobbies, once designed for tellers to handle face-to-face customer transactions, are being transformed into self-service, customer-centric technology hubs complete with digital signage, interactive kiosks, iPads, elaborate video walls, Interactive Teller machines (ITMs), and other banking technology. This evolution is occurring from the smallest community banks to the largest corporations with one goal in mind: convenient banking with a personal touch. The extended use of technology allows the banking market to educate and service customers in the most efficient and dynamic manner. While technology plays a definite role in today’s branch office, the key is to create an appropriate mix of digital and traditional options. Branches need to have the right technology for tech savvy customers tapered with more traditional alternatives for those who aren’t yet as comfortable with technology. For example, interactive kiosks are being added to many branch networks as they have the ability to reduce costs, improve efficiency, enhance customer service, and increase sales. These benefits, however, are only realized if the kiosk is being used. Adding the capability of printing paper brochures or information from the kiosk may multiply its effectiveness by both satisfying the tech savvy customer and pacifying the more traditional customer. There are many more traditional options that can help bridge the gap for those who aren’t as familiar or as comfortable with technology. iPads that can scan physical boxes and play informative “sales” videos about a financial product, icons that only have to be touched to view an educational video, and consistent messaging between traditional and digital mediums are all ways to seamlessly integrate technology into your branches. Though convenience is often the driving force behind the integration of technology, security must remain on the forefront. The use of Mobile Device Management (MDM) or Enterprise Mobility Management (EMM) solutions lock down and restrict customer facing devices and rogue wireless access point detection, which prevents the introduction of malicious WiFi in your environment. The use of embedded LTE cellular connections, which ensures a direct connection to a cell tower instead of WiFi, which can be easily hacked, will demonstrate your commitment to security and will help guarantee your technology strategy is a successful one. While there is some question as to whether or not technology will bring new customers in, it is proven that technology will keep customers satisfied and coming back. Although most customers don’t expect the exact same service and level of technology across every industry, the basic expectations have become universal. Customers want easy, fast, and on-demand, even when it comes to banking. Plain and simple, customers today expect technology. The trick is finding the right level of technology that the majority of your customers want and demand and then helping others adapt to it. While technology offers numerous benefits, studies show that not everyone is eager to adapt to change when doing their banking. Your employees are key in helping customers embrace the technology movement. They need to accept the technology movement themselves before they can assist customers in agreeing to change. Branch personnel will be the reason for success, but could also be the reason for failure of adoption. Banks need to educate their employees first. Some of them get it, but many will see technology integration as a way for the corporate leaders to reduce headcount. They may reject it because they believe their jobs are on the line. Banks need to teach their branch personnel that this isn’t a way to reduce employee count, it’s a way to enhance the customer experience. Time will be well spent demonstrating to customers, answering their questions and educating them on the benefits. There is no doubt that technology is permeating every facet of the world in which we live. It is causing our expectations to become grander, our desire for information to be quicker, and possibly our attention span to become a bit shorter. Ensuring your branch is equipped to meet the needs of both the early adopters as well as those that may need a little more hand holding when it comes to technology, will guarantee a more successful branch transformation into the future.